SIP Sub-Irrigated Planter aka incorrectly as "self-watering"
There are those who would prefer not to use PVC pipe or vinyl tubing when making sub-irrigation planters (SIPs aka “self-watering”). Recycled water/juice bottles are an environmentally friendly alternative. 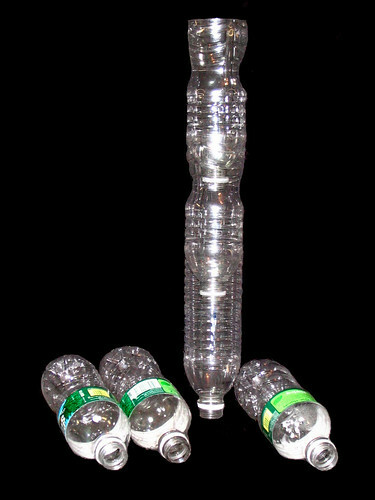 It's very easy to make fill pipes from recycled water bottles and help the environment by keeping them out of our landfills. Simply cut off the bottom with a box cutter and stack them for any length fill tube. Small bottles of the one pint + size take up the least room inside the SIP. I would encourage everyone to use this method. It's practical, cost effective and green. To the eye of an experienced gardener, there's nothing particularly significant in this photo. 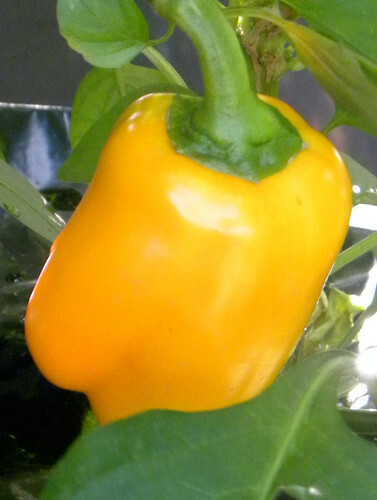 It is simply a ripe but juvenile yellow bell pepper. To appreciate this photo, you need to know the back-story of how the plants in the PS 102 PONG* bounced around the neighborhood in recycled pop bottle planters before they found a home in the sun. It's history now but the significance of this heirloom bell pepper is that it's from a plant that grew from adversity with the very significant help of the sub-irrigated planter (SIP) that it is growing in. But for the SIP, it is unlikely that it would exist. At the risk of being maudlin, I think of it as a symbol of the use of urban greenscaping and modern methods of growing food in the city in spite of adversity such as contaminated soil and lack of tillable land. Even though late in the season, there are many more pepper and heirloom tomatoes ready to ripen. With a little bit of luck, there should be some juicy ripe tomatoes for the children, teachers and parents of PS 102 to enjoy before too long. Incidentally, the pepper is gone. It became the "first taste" for Margaret Sheri, proud mother of the PS 102 PONG. She deserved it! Photo taken yesterday, August 23. 2009. Click on photos for a larger view on Flickr. PONGs - No Construction, Heavy Equipment, or Earth Moving! Notice that the sub-irrigated planters (SIPS) were moved from the path to the fence which acts as a trellis. It will be interesting to see how high the heirloom tomato vines climb by the end of the growing season. Stay tuned! Even though the planting was delayed by almost two months, there are now many heirloom peppers and tomatoes on the plants. See a photo set slideshow on Flickr. NY1 visited the Waterpod now berthed at Staten Island and interviewed artist/founder Mary Mattingly. Among the green environmental systems mentioned were the sub-irrigation planters (SIPs) supplied by the Center for Urban Greenscaping (CuGreen). "Nothing goes to waste on the Waterpod with rainwater being used for drinking, for washing, and for the particularly prolific sub-irrigation system that helps the garden grow." The Waterpod is now berthed in Staten Island where it will be until August 31. Visit the Waterpod tomorrow and Sunday from 11 a.m. to 7 p.m. Tomorrow the Waterpod will be part of the Atlantic Salt Maritime Festival from 10 a.m. to 4 p.m. Take the Staten Island Ferry to the St. George terminal and then the S90/S40 bus to Richmond Terrace/Lafayette Avenue stop. I plan to be on board most of the weekend and will be pleased to meet you and answer any questions you may have about modern sub-irrigation planter (SIP) systems. Come to the Waterpod today and see the "educator"
Portable sub-irrigated planters (SIPs) like these have no moving parts and they don't shake, rattle and roll. They just sit quietly and grow superior plants, whether they are edible, flowering or just plain foliage. While doing so they conserve water and your precious time. All they want is a sun-filled location, even a paved one. There is a clear "educator" SIP (photo above) loaded with healthy heirloom tomato plants on the Waterpod that can speak to you far more eloquently than I. There is also a collection of everyday SIPs like the one to the left with heirloom tomato plants climbing to the sky. Come to the Waterpod in Brooklyn Bridge Park and see for yourself. In this case, seeing is definitely believing. The pod artists have certainly discovered this. Prior posts about the Waterpod. The Waterpod made the front page of the online New York Times this morning. That is Mary Mattingly, artist-founder of the Waterpod project (prior posts) explaining the sub-irrigated demonstrator to some visitors. It is fair to say that she and other members of the crew have become believers. That is easy to understand because they can see the comparison with their own eyes. It is great that the Waterpod got this kind of well-deserved publicity from the New York Times. It is clearly a lifestyle piece, however, with no real reference to the environmental issues addressed by the project: sub-irrigated planters and urban food production for example. I was pleased to see this photo even though few will understand it's meaning from the caption. Ms. Mattingly gives a tour on the Waterpod, which provokes a constant stream of intrigued onlookers. Thanks to our antiquated horticultural education, the writer likely relates only to top watering a garden with a watering can like this. Ms. Mattingly waters a vegetable garden on board. In my view, New York Times writers are clearly out of touch with modernity related to urban food production. They write for more well healed suburbanites, agri-intellectuals and foodie activists rather than middle class and lower income city dwellers, which is where the information is most needed. If you are in the New York metro area, be sure to visit the Waterpod on the Brooklyn Bridge Park waterfront this weekend. I will be on board tomorrow, Saturday and Sunday. Hours are 3-7 pm on Friday, and 11-7 pm Saturday and Sunday. I'm looking forward to seeing you there. Bring your family and friends. This planter now installed on the Waterpod shows clearly how a sub-irrigated planter (SIP) works. It emulates the sub-irrigated utility bucket planter (aka erroneously as "self-watering") in the foreground. There are now six of these gray planters on board growing heirloom tomatoes. The clear SIP demonstrator is made from a party (ice) bucket with a clear cookie container glued (clear Goop) to the bottom. There are three party cups inserted in holes in the bottom of the bucket. They act as soil wicks. The planter holds three heirloom tomato plants grown from seeds, moved up into pop/soda bottle planters and now this demonstrator SIP. Within a weeks time the roots grew out to the edge of the planter and are clearly visible. One of these SIP demonstrators should be in every school in America. Maybe then we would overcome our antiquated horticultural education that inhibits growing food in the city. It is truly a national disgrace. These planters will produce in the range of 50% more food per square foot, while saving water, nutrients and precious time. All that is needed is sunlit space even if it is paved. Come to the Waterpod and see this and other urban gardening methods. There are many other utility bucket planters with drain holes on the Waterpod. We are going to attempt to convert them to sub-irrigation without replanting. If it works this would be a solution for many who were unaware of SIPs and planted in drain hole buckets. 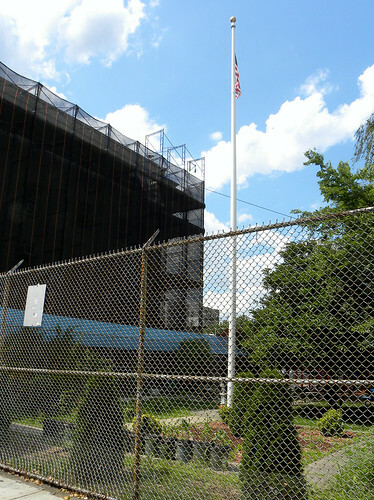 Read this prior post for directions to the Waterpod which is now berthed in Brooklyn. Next week it will move to Staten Island. Chris Tsinger has done us all a public service by uploading his series of organic container gardening videos to YouTube. Part 1 shows his sub-irrigated (aka self-watering) bucket planters (SIPs) made from recycled pickle buckets. Part 2 is also about SIP's and Part 3 is about his experiences with hydroponic buckets. For those in the New York metropolitan area all of these container systems are now on public view on the Waterpod. I installed six heirloom tomato plants intstalled in SIPs yesterday. They are immature plants at this time but if the PONG at PS 102 is a guide they will soon be on their way reaching for the sky. 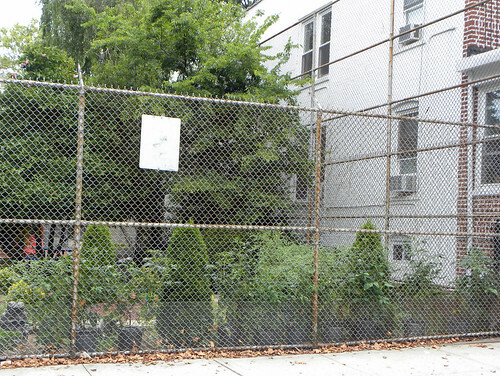 Today we will move the PS 102 heirloom tomato plants next to the tall fence surrounding the garden. When they are attached to the fence, it will be their stairway to the stars. Stay tuned for photos. In the meantime, plant a PONG at your school or in your neighborhood. The Waterpod is docked on the Hudson River at 125th Street until next Tuesday when it will be towed to Brooklyn Bridge Park for two weeks. After that, it's on its way to Staten Island for a two week stay. Be sure to visit! School groups are welcome by appointment. I demonstrated making pop/soda bottle planters to two of them yesterday. Before you go in person you can visit the Waterpod on the web and check out the event schedule. Rodolphe is a neighbor of and (as I am) a fan of the Rooftop Garden Project in Montreal. He sent this link to an extensive photo series of his rooftop garden. The planters are recycled buckets made into sub-irrigated (aka self-watering) planters. He was lucky to find such attractive green pickle buckets. Note that he has distributed the planters around the roof to mitigate the weight load. This is a good idea for any roof but a particularly good idea for snowy rooftops in the winter. Thanks to Green Roof Growers Heidi and Bruce, there is a new small space vegetable garden in an illogical location in Chicago. This sub-irrigated (aka self-watering) bucket garden is along the side of the Avalon Community Church. That is Rev. Paul Robeson Ford standing in the background. He and his congregation deserve much credit for their open mindedness to new ideas. Check out this slideshow. Perhaps we will see some photos later this summer of the tomatoes climbing the fence trellis to the right. Sub-irrigated bucket gardens like this could be “greening” food deserts all over the United States, all over the world. All it will take is education of the type supplied by Heidi and Bruce. Back in the old days before pumps, we put out fires with buckets. That's where the term "bucket brigade" originated. Rather than all the nostalgia about dirt based Victory Gardens from WWII, we need to revive this memory of the past but in modern form. Sub-irrigated planters, or SIPs as many call them, represent a modern, 21st century “bucket brigade” method of growing food in the city. If the lack of fresh food is a "fire" in the city, this is one way to put it out. I can see on the web that modernity is slowly taking hold. It should have happened long ago if not for the rather retrogressive mindset of our horticultural institutions. They appear to be stuck in a drain hole. Through the power of individuals working together, we can overcome this. Institutions will follow “we the people”. Please join the parade. Blog, text, Twitter and talk about what you’re doing. We will all benefit. A note about utility bucket esthetics: The primary mission here is to grow fresh food in the city rather than to paint pretty pictures. The utilitarian look of these planters can easily be upgraded with some type of decorative facade. Bright color spray paint would do the job for kids gardens. My background includes both landscape architecture and interior plantscaping. The routine practices of both these professional disciplines would convert this garden to a pretty picture garden in short order. They do it every day. Think recycled lumber for starters. An Urban Garden to Improve the Quality of Life for Bees, Butterflies...and You!